Getting back into art as an adult is all due to the adult coloring book trend for me. I had given it all up and had been concentrating on the serious things in life. Getting back to my creative side has, however, made all the parts of my life better. The more art supplies I bought to color with, the more I wanted to play with my other art supplies that I’d tucked away. The more I played with color, the more I wanted to create and grow and learn and be able to call myself an artist too. Enter Life Book! Join Life Book 2018 any time! There is now lifetime access so you are never behind! I looked for art classes in my area in watercolor and painting and drawing and couldn’t really find much but to improve the look of my Facebook newsfeed I’d started following artists in all area’s that appealed to me. I tend to love looking at bright happy colors and beautiful whimsical characters, mermaids, and fairies, hand-lettered pages, and bits of ephemera adding to the artisticness of the piece. That opened me up to all of the artists across the world that give art classes online. What’s cool is that these classes in many ways are even better than going to a class locally because I don’t have to pack up all my supplies and I can stop the teacher and rewind everything they say whenever I need to. Many of the classes are lifetime access and some even allow you to download the video’s of the classes for your own use. So onward to Life Book 2018! I really can’t explain how much I am enjoying this art journaling/art therapy /get messy and happy experience let by Tamara Laporte from Willowing Arts. She heads up a team of a whole bunch of wonderful artists who share new lessons with our big group of loving and lovable beginning to expert artists to learn and enjoy. It doesn’t matter that this class has already started, you have access to all the lessons for LIFE this year for the first time AND you can download them to use offline whenever you’d like as well. I’m just LOVING Lifebook! So fun, empowering and helping me SO much with my art skills! 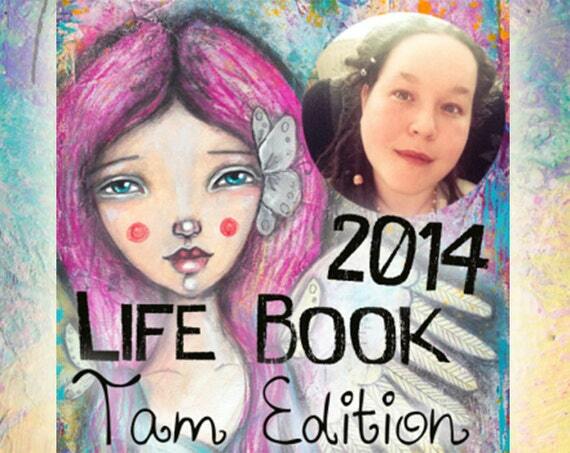 Life Book 2018 is New & Improved, Bigger & Better! 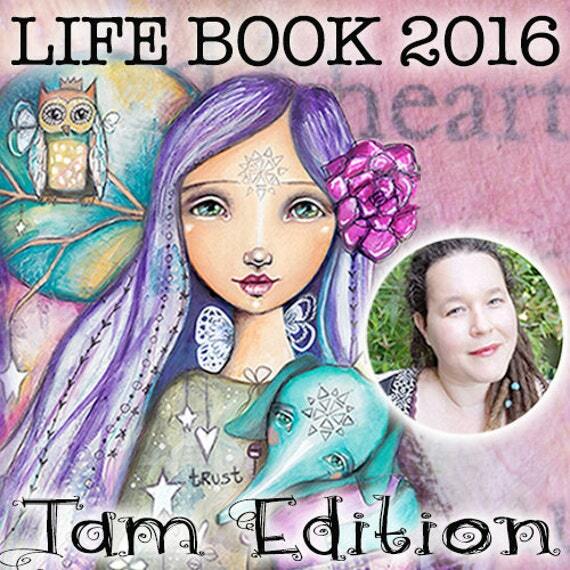 2018 is a special & exciting year for Life Book because the launch of LB2018+ coincides with the publication of Tamara’s book (all about Life Book) AND she is making the Life Book offer more holistic by opening the course up to other art forms (like clay work, photography, and writing) + Tamara is also bringing in some more wellness experts that will support people on their wellness/ personal development journey!! Additional healing AND art disciplines (several other experts who do things like yoga/ aromatherapy/ NVC & mindfulness etc + other art disciplines like sculpture/ doll making/ photography & writing etc to make the entire healing/ wellness aspect of Life Book more holistic (these offers are on top of the art lessons not instead of). Virtual Life Book Gift (or Swag) Bag!!! 😀 Everyone who signs up to Life Book gets a virtual ‘goodie bag’ filled with things like: high res prints (for you to print out), exclusive discount codes from teachers and sponsors, free ebooks and ezines and other awesome stuff! yay! Several Facebook LIVE sessions with Tam, these will be in the form of: Check-ins/ FAQs/ Impromptu art sessions & They will be recorded and available for those who can’t make the live sessions. Join Life Book 2018 any time! What exactly do you get in LIFEBOOK 2018? In other words: you get over 85+ inspiring, creative, uplifting and life-enriching sessions this year with creative and wellness experts that will blow your mind! I have been checking out other resources to help me with drawing whimsical faces and have found a few that I LOVE and have been amazed at my results after only a bit of practice. Still not quite ready for prime time but enjoyable to me in my art journaling and that’s really the point of it all. 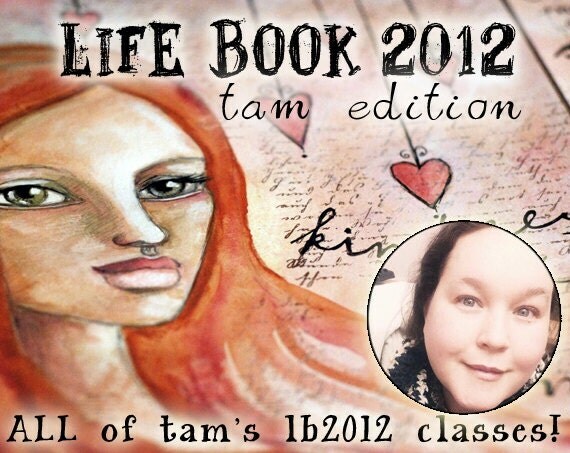 Click here to join the LIFE BOOK 2018 fun! Click to Order Amazon U.S.
A series of Quirky Birds lesson – Very Popular! She’s still making these cuties now. 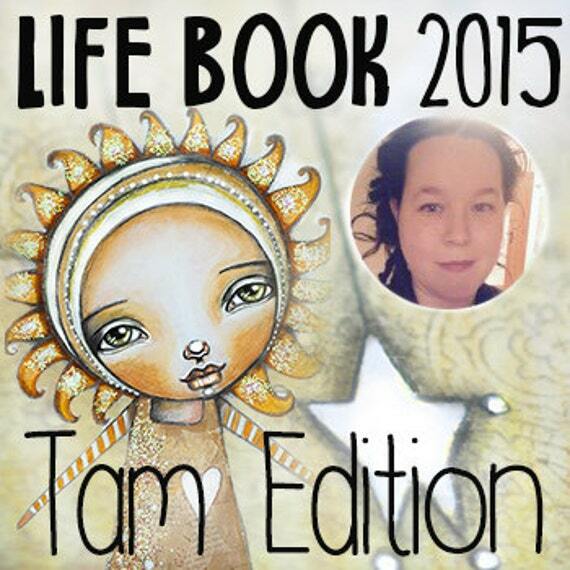 Binding your Life Book – each year Tamara has a new idea to bind your Life Book. The Happy Traveller – Create a front-facing girl (your ‘Happy Traveller’) with 1 or more ‘sacred soul animals’ surrounding her. These ‘sacred soul animals’ will be with you on your journey. The idea is that you can invoke or refer to these animals as ‘animal medicine’, they are creatures that can guide you/ help you on your way. Creativity Takes Courage – A great warm-up session to get your creative mojo started by going over some warm-up mixed media steps, both for the mind and for the hand. Your Quirky Amazing Life – I love making Quirky Birds, they are super fun, relatively easy, get you in touch with your inner child and they bring smiles where ever they go! 😉 For this lesson, we use characteristics of people/ things we are grateful for and assign them to the quirky bird as a way to celebrate and honour them. Technique-wise we work with a very basic wet-in-wet technique and I also include a PDF on ‘cultivating gratitude’. Roots & Ground, Wings & Light – Create a mixed media front-facing portrait. We also reflect on the theme ‘honouring and grounding’, includes an optional meditation. Your Story Matters, The Ripple Effect – Using the fun technique of foam marbling and reflecting on getting in touch with the interconnectedness of us all and how each and every one of us matters in this world. We symbolically represent this theme in the form of a drop of water falling into a larger body of water, making ripples. 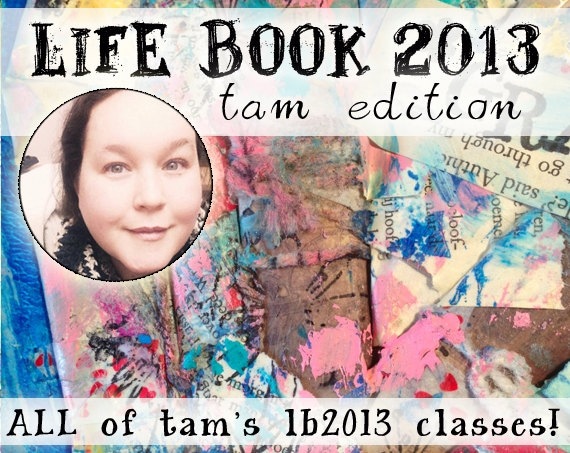 Dancing With Shadow – Focusing on working with our inner critic and our creative blocks and using Tam’s favourite ‘paint over collage’ art technique. Work with symbolism and transformation. ‘Paint over collage’ is a really interesting and different way to start a painting. It can really expand your understanding of shape & colour and lends itself well to go deeper. Includes optional meditation. Embracing All of You – Working with the concept of ’embracing all of ourselves’, including the sadder/ darker parts of ourselves. Includes a video and PDF on ‘self – forgiveness’. Create a ‘sitting’ girl using a ‘silhouetting’ technique, gelli-plating and ‘masking’. Grow Free – Letting loose and become free-er by creating creative abstract flowers! It’s so fun and liberating creating in this way. Includes an optional personal development exercise which works on transforming limiting beliefs into liberating beliefs. Expressive Florals – smaller bonus lesson from Life Book 2014 (a fun bonus lesson using paint to create big colourful messy expressionist flowers). Build Your Dream & Affirmation Board – Smaller ‘bonus lesson’ where we reflect on the connectedness of us all and celebrate our vulnerability and authenticity as a way into deeper connection with our fellow humans. I show you how I like creating a dream/ affirmation board in the non-traditional (just-Tam) way. Zentangle Butterfly – smaller ‘bonus lesson’ where we create a zentangle butterfly on an inky background that flies towards everything you’re wanting to call in more and leaves behind it a ‘trail of what you want to let go of’. Other bonus lessons include: ‘art bites for beginners’ which explains basic supplies and how they are used and Basic colour theory. Pumpkin and Spice – working with the theme of Celebration & Play we experiment, explore, invent, thinking outside of the box, doing something different to what you usually do. Create a beautiful Autumn wreath and make some super cute quirky pumpkins! 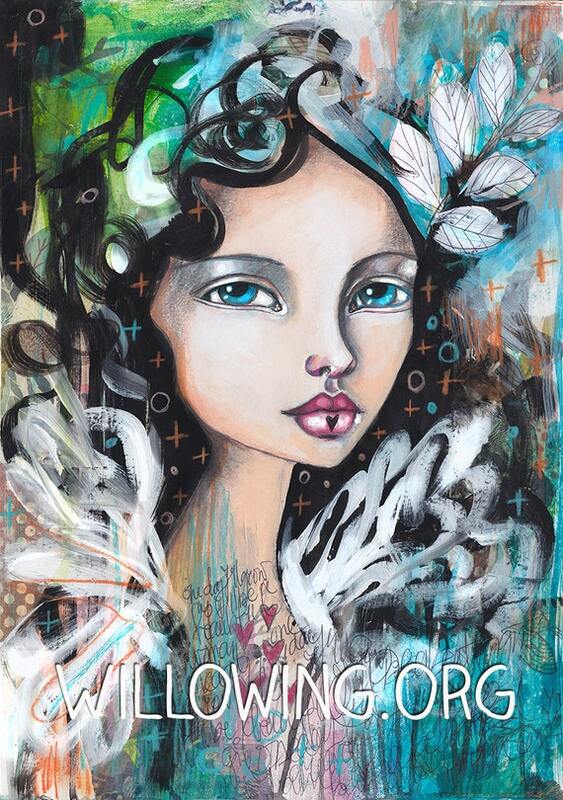 Tamara Laporte also sells prints of her lovely girls and creatures on her Etsy Page here.